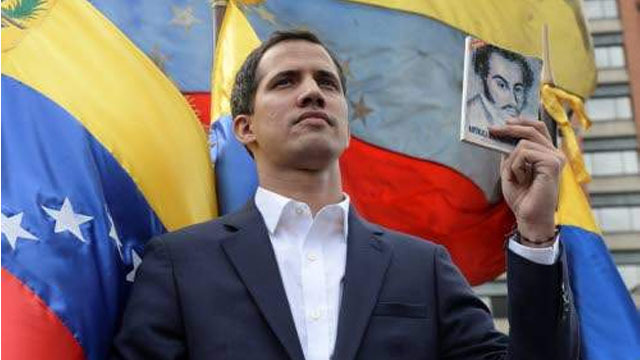 VATICAN CITY (AP) — A delegation representing Venezuelan Opposition Leader Juan Guaidó met yesterday with Vatican officials as the Holy See weighs a request from socialist President Nicholás Maduro to intervene in the country’s political crisis. Officials from the Secretariat of State expressed Pope Francis’ sympathy to all Venezuelans who are suffering, the Vatican said. Spokesman Alessandro Gisotti said “the grave concern was underlined that a just and peaceful solution be urgently sought to overcome the crisis, respecting human rights and seeking the good of all of the inhabitants of the country and avoiding bloodshed”. The Vatican didn’t say who participated, but the delegation was photographed with Monsignor Edgar Peña Parra, the Venezuelan-born “substitute,” or deputy secretary of state. His boss is Cardinal Pietro Parolin, a Venezuela expert stemming from his years as the Vatican’s ambassador to Caracas. Maduro has asked the Vatican to help launch talks. Francis has said both sides must request external mediation and expressed a willingness to sound out Guaido’s camp. The Venezuelan delegation later met with the Italian interior and foreign ministers. Italy’s populist government, which splits power between the right-wing League and the anti-establishment 5-Star Movement, has not joined other countries in lining up to back Guaido. The Italian Foreign Ministry identified the delegation members as Francisco Sucre, president of the foreign affairs commission of the anti-Maduro National Assembly; former Caracas Mayor Antonio Ledezm, and Rodrigo Diamanti, an activist whom the ministry identified as Guaido’s representative.